Three species of Angelica – Angelica archangelica, Angelica pachycarpa and Angelica sylvestris ‘Purpurea’ – have woven themselves into my gardens and garden mythology in very different ways. Angelica is a genus of about 60 species of tall biennial and perennial herbs of the family Apiaceae (or Umbelliferae), native to temperate and subarctic regions of the Northern hemisphere. Angelicas typically grow to 1m – 3m tall (3-10ft), have large bi-pinnate leaves and compound umbels of white or greenish-white flowers. 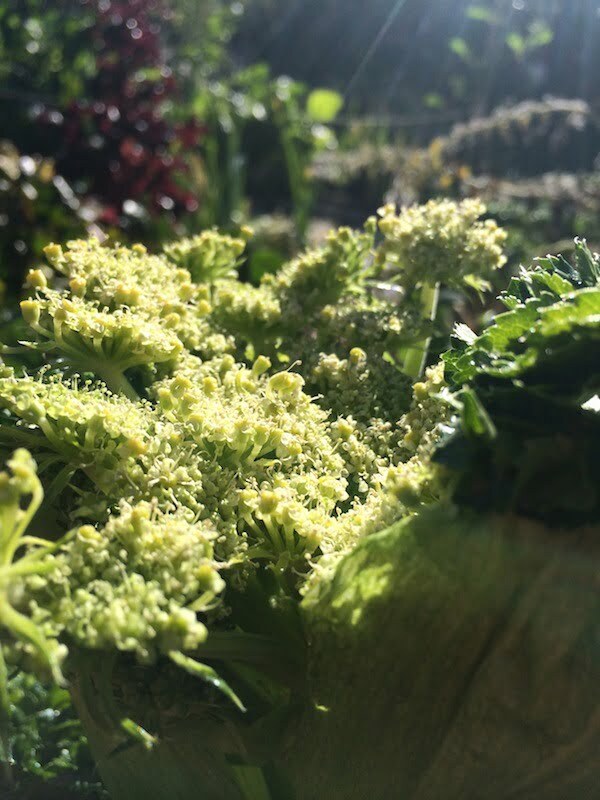 There are about thirty varieties of Angelica, but Angelica archangelica is the only one officially employed in medicine and food, except in China where the species traditionally used for herbal treatments is Angelica sinensis. 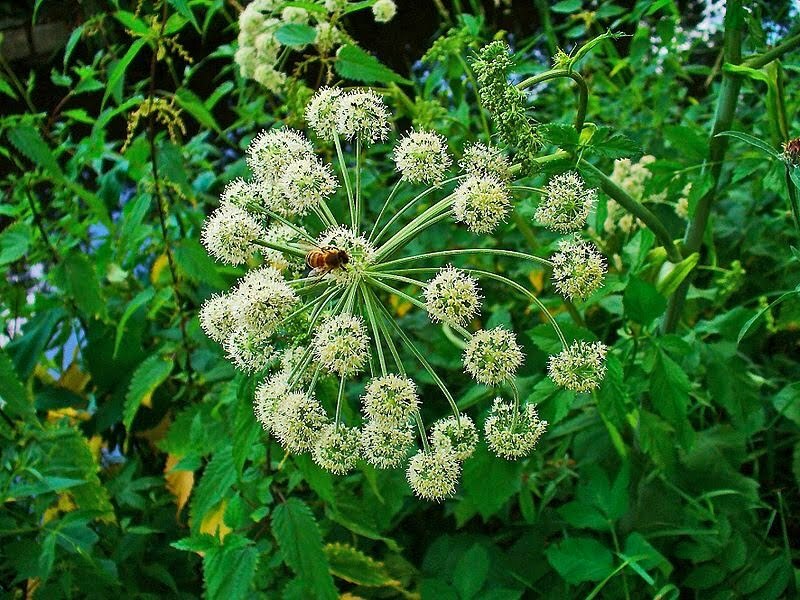 One legend has it that an angel appeared to a monk in a dream and revealed to him the plant that would cure the plague; that plant was thereafter known as Angelica. Its connection with Michael the Archangel (it was also purported to bloom on his Day) and its perceived ability to ward off evil spirits make it one of the most powerful medical and spiritual herbs and it was given the nickname ‘Root of the Holy Ghost’. The first Angelica is that of my childhood. I was intrigued by the green crystallized (or candied) strips that appeared as the ‘stems’ supporting the red maraschino cherry flower ‘petals’ on iced birthday cakes. While I disliked the bitter-almond taste of the cherries (and later found to my dismay they were artificially flavoured and coloured), I favoured the bright green stems and their strong, sweet and unusual flavour. 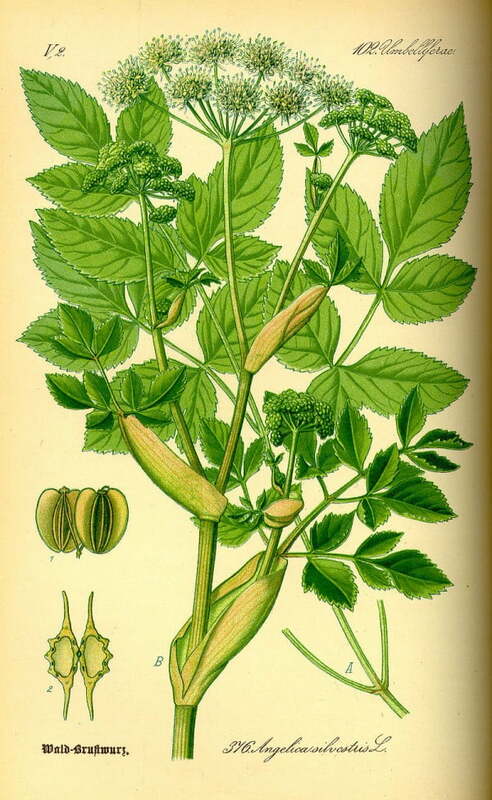 Demand for crystallized angelica has declined rapidly since my childhood, although ‘Angelique de Niort’ is still being made in the village of Niort, France, and has been done so since the 1700s. This region is one of the few areas left in France where Angelica is grown for candying. Other traditional recipes are available (see, for example, at the Apothecary’s Garden). Angelica roots and seeds are sometimes used to flavour gin, and it is one of the 130 herbs and plants macerated in alcohol to make Chartreuse. Angelica archangelica can grow to 2m (7ft). Believed to have originated in Syria, it has now naturalised, with other Cow Parsleys, throughout Northern Europe, as far north as Lapland. I begged my grandmothers to plant it in their respective gardens, but both agreed Brisbane was far too warm for it to survive (although I now suspect they were both averse to the weed images ‘Cow Parsley’ evoked). 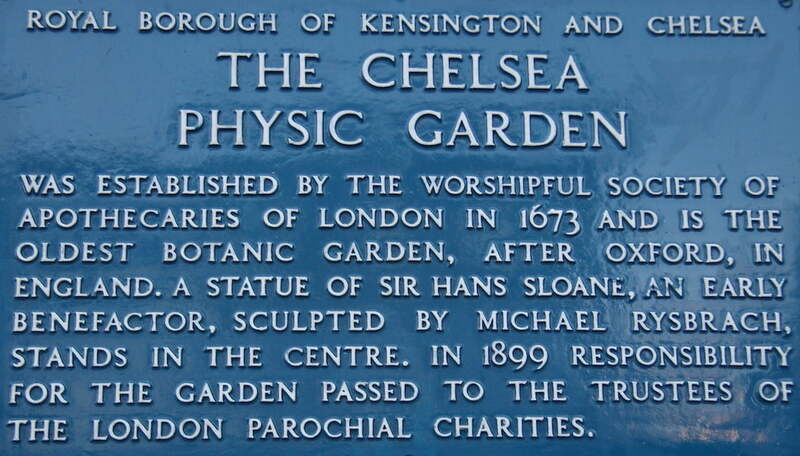 The last time I was in London I revisited the Royal Botanic Gardens, Kew, but also made a point of travelling to the Chelsea Physic Garden. 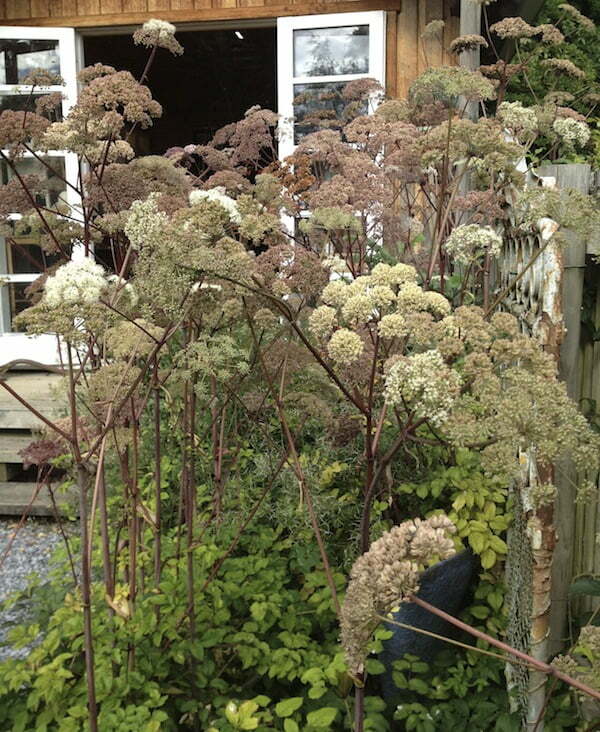 It was a cold, but clear, late autumn morning and seed heads were the feature of the garden at that time; none stood prouder and taller than those of Angelica archangelica. In the late winter, things wonderful, shiny-green and noble stir in my garden. My much-treasured Glossy Angelicas have withstood the frosts and finally open out into glorious, wide umbels of creamy-pale green flowers that bring light, colour and form to the paucity of the early spring greenery. 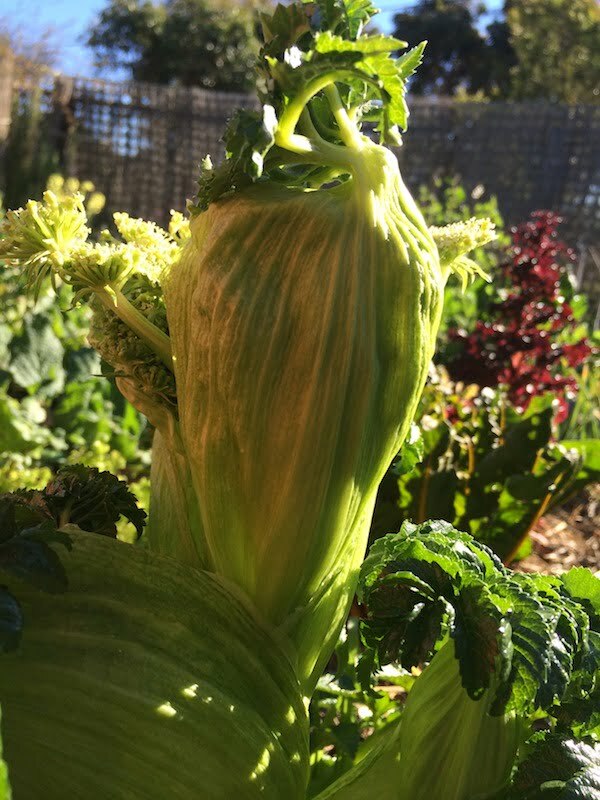 This Angelica is much showier than its edible cousin with its strong, twisted, upright structure (although it is a shorter plant, even in flower). The stiff leaves arc outwards gracefully and both they and the flowers last well if cut and placed in water indoors, in a cool place. 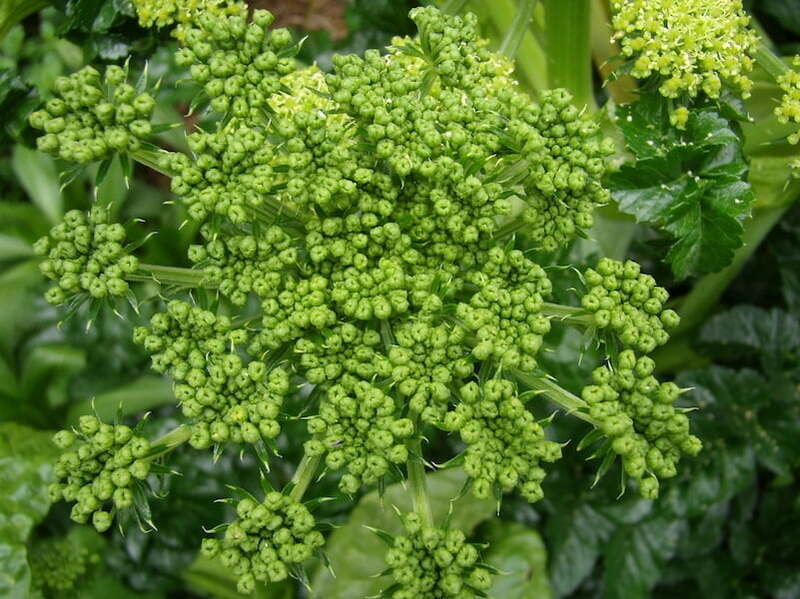 Although Angelica is termed a perennial herbaceous plant, it is biennial in the botanical sense, in that it is neither annual, nor naturally perennial. The seedlings grow slowly towards maturity, over 12 months, into a clump of glossy green leaves. 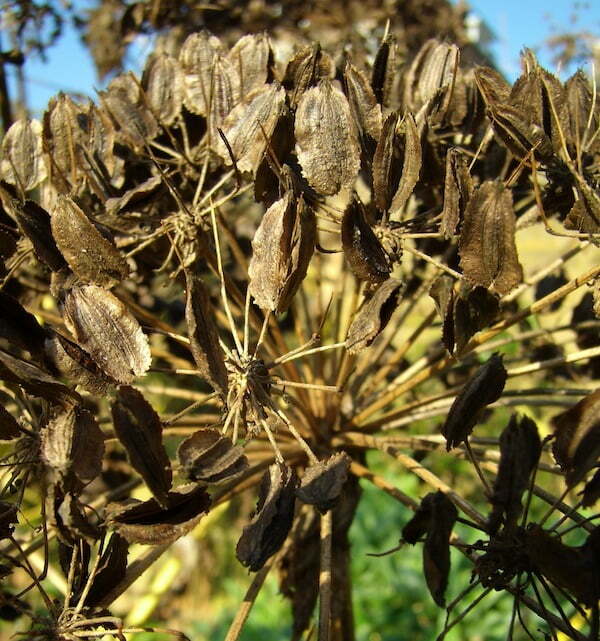 The following year an upright stem appears, bears huge umbels of flowers and eventually produces seeds that will self-sow to produce successive generations. Old plants die off after seeding once. As with all Angelicas, many seeds are produced on the attractive flower heads; however, the seeds are only viable for a short time and must be sown fresh. Although many seedlings come up around the parent plants, from my experience they are best transplanted when small as they quickly develop a long root and do not survive disturbance as they mature. I believe Angelica pachycarpa to be superior to Acanthus mollis as a feature plant; its glossy leaves, arced branches, upright and clean habit (yellow lower leaves can be easily pulled off) and amazing flower heads trump the sagging, dull leaves of the (often invasive and intransigent) Acanthus. When I travelled with my equally plant-ardent mother to Wychwood, the much-loved garden under the Great Western Tiers, near Mole Creek in Tasmania, it had been a mecca for many of my gardening colleagues and I am so glad we made an appointment to visit, albeit it being a very cold day. We were warmly welcomed by Karen Hall and her partner Peter Cooper, a photographer. Although it was autumn, and many of the summer perennials were finished (I must concede it is a stunning garden at any time of the year), one plant caught my eye wherever it was used through the garden. I asked about it and Karen disappeared to return with a packet of freshly picked seeds of Angelica sylvestris ‘Purpurea’, with the advice, as above, to plant them as soon as possible. I did that and waited. And waited. And waited. A year later, as I was emptying soil from a tray of seemingly plant-less tubes, a small seedling fell into my hand. One seed of 16 had germinated. I have protected and cajoled and cossetted this tiny plant and hopefully I can plant it out this spring. 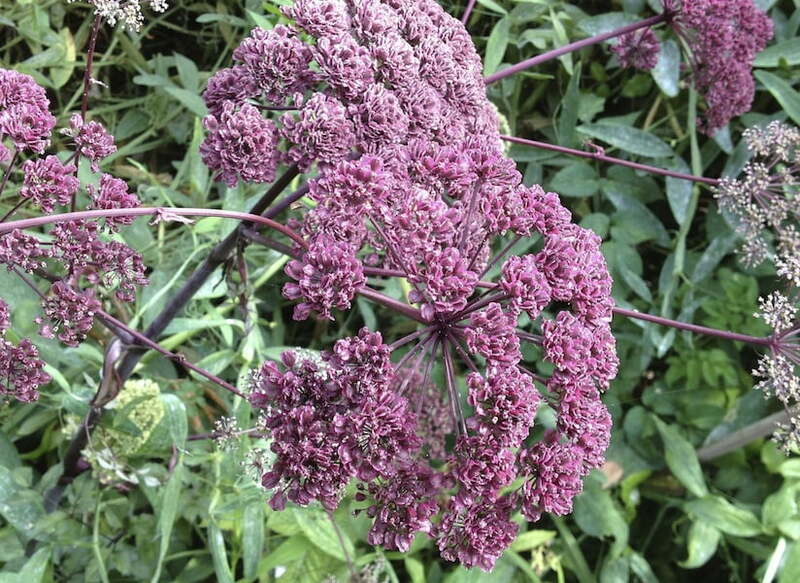 Angelica sylvestris ‘Purpurea’ is tall variety in flower, growing to 2.5m – 3m (8-10ft). I have several garden spots in mind, which will show off the beautifully suffused, deep purple-black stems and large umbels of pale purplish-pink flowers that fade to white … but I will give it pride of place away from its relative, the more delicate look-alike, Purple Cow Parsley Anthriscus sylvestris ‘Ravenswing’ – as each shine in their respective bronzed/purple way. Beautifully written and rich with knowledge. Lovely photos. Thank you. I too love Angelica and for a long time grew A. gigas which I loved but have now lost unfortunately. Its purple flower heads were stunning. Thank you for your comments – A. gigas is on my wish list too. Do you know where I might get some seeds? Wychwood is fantastic. We found it about 10 years ago and I still dream of duplicating some it’s plantings in our patch. Wonderful article Catriona. I am lusting after some Angelica now. That purple form I can certainly use. Thank you for your comments – I am lusting after A.gigas now!